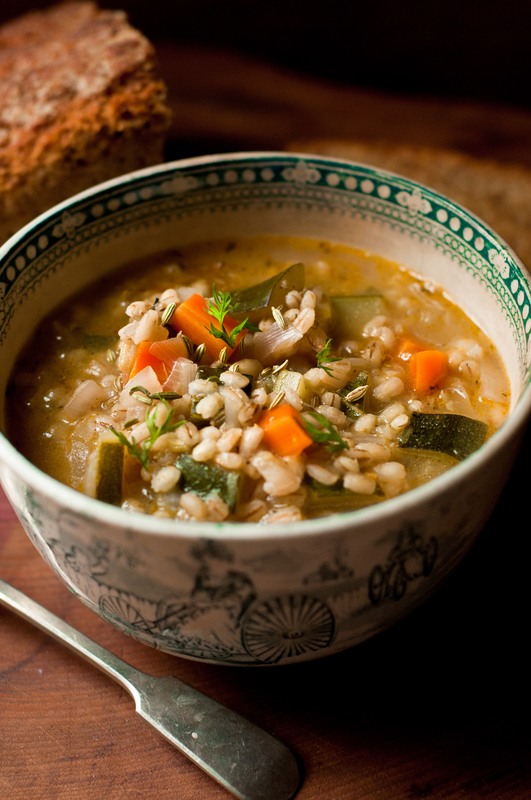 When it comes to quick and easy comfort food to brighten up yet another snowy day there are few things that beat a filling barley soup. It’s basically the soup that keeps on giving as the next day (if you’ve any left) the grains will have swollen and soaked up more of the soothing liquid and transformed it into a rib sticking stew. If you are familiar with this blog you will already know my love for using a rich, full bodied cream sherry in my dishes, it’s much cheaper than Marsala which I also adore using and kept nice and chilled in the fridge makes for a nice little cook’s tot as the soup gently simmers. Melt the butter in a big saucepan, add the carrots, onion, garlic, fennel seeds and cook for a couple of minutes whilst stirring. Add the barley, thyme, bay leaves, garlic granules and stock. Bring to a boil then simmer for about 15 minutes, add more water if needed. Add the diced courgette and sherry, continue to cook until barley is cooked then season with celery salt and pepper and stir in most of the carrot tops.